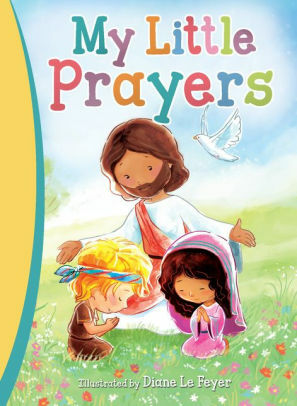 We've recently been introduced to our first book in the My Little series called My Little Prayers. With "My Little" in the title, of course you can only guess that this a series written specifically for children, but there is also another reason. You see one of the other most noteworthy aspects of this particular collection is that the books are really small, perfect for my son's tiny hands. I remember when it arrived–I open up the box to find this precious little storybook, and thought "how adorable!" I really like that it also offers a table of contents, making it easier to skip to a certain topic. Throughout each of the eight sections you'll find a collection of prayers taken from many different sources. Some are written by poets, while others are quoted right out of the Bible. Whether it is playtime or bedtime, children will find a prayer to recite that just right for their situation. This is a great little book to take on the go, since it really is pocket size. It kind of reminds me of a kid's version of my Prayer Points book–it's compact in size and offers a collection of different prayer topics perfect for young children. I personally feel that it's important to teach prayer as early as possible. The illustrations by Diane Le Feyer are delightful and full of pretty colors. It's good for little ones to know that God is always there listening to them and waiting for them to talk to Him. If you are looking to introduce your child to praying, then I highly recommend picking up My Little Prayers for them.